The book lists were compiled and curated by Jared Wasson of the Reader's Advisory Department of the Downtown Branch. 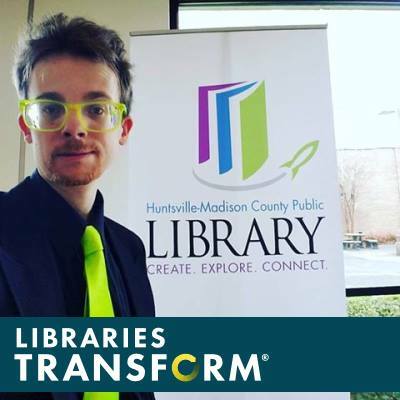 He is our resident expert on all things science fiction and fantasy and specializes in connecting patrons with their next great read as well as serving as the science fiction collection manager for our library system. The graphic novel lists were compiled and curated by yours truly, Jon Schafle, the adult graphic novel collection manager for our library system. Looking for something new to read? Curious about science fiction or fantasy? Take a look at some of the titles we've complied in this list of the most popular and recommended titles in both genres that are available in our catalog. Regarded as must-reads and staples of their respective fields you'll be sure to find your next favorite book! The lists are not ranked but instead listed in alphabetical order by the author's last name, there is also some overlap between these two genres so you may see a book listed in both sections as well. In addition, below the book lists is a list of top graphic novels as well. These lists are a mix of graphic adaptations of books on the previous lists as well as top original works in the areas of science fiction and fantasy, and arranged by title. A list of the most important comics and graphic novels to read in your lifetime. A huge flow cart of NPR's list of the top science fiction and fantasy books and what to read first/next. A guide to various horror titles broken up by collections and types for every age range. A complete reading chronology of the Star Wars franchise books, including the current Disney canon as well as the old Expanded Universe (or Legacy) titles.